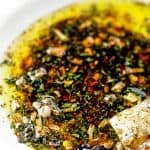 All the fun of a bread dipping oil but with a different set of spices! My Southwest Dipping Oil is best served with warm tortillas! Combine the ingredients and store in an air-tight container until ready to use. Add the Southwest Seasoning Mix to a plate or shallow bowl. Pour the olive oil over the top.